Mosquitoes are dreadful pests that like to feast on our blood and so you may wonder what or who are mosquito’s natural predators. You would be delighted to know there are many animals and birds that feed on mosquitoes. Before we see the details of things that eat mosquitoes, you need to understand mosquito has 4 distinct stages – egg, larvae, pupa, and flying adult. Some animals feed on mosquito eggs while some eat mosquito larvae and pupa and then there are some that only eat adult mosquitoes. Just like the mosquitoes, dragonflies depend on water to lay their eggs. The larvae of dragonflies eat a large number of mosquito larvae during their first development stages. 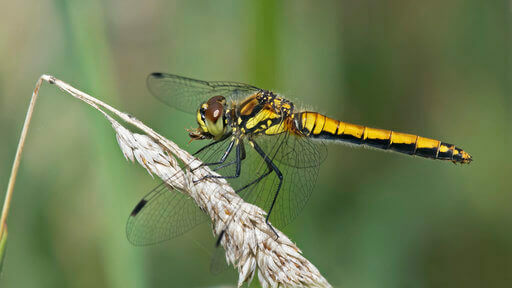 When they become adult dragonflies, their diet also contains adult mosquitoes. Koi, guppies and goldfish feed on mosquito larvae. If you have a small fish pond and lake nearby, you can introduce some goldfish, guppies or koi fish which can reduce the mosquito population by feeding on mosquito larvae. Tadpoles are also known to feast on mosquito larvae. To attract frogs in your area, you can install some shelters like hollow logs or put some small rocks on the large bed of rocks that act as a shelter for these amphibians. Just like dragonflies, frogs and toads prefer to sit on rocks near the pond or wetland areas where it is easy for them to dive in and come out. Bats feed on mosquitoes at night. An adult bat can eat up to 1000 mosquitoes per hour. You can install bat houses to attract bats which will then feed on mosquitoes. As the name suggests, mosquito repellents will repel the mosquitoes away from you. Most mosquito repellents works by interfering with mosquito’s prey location system. The mosquito’s prey location system is based on its antenna which has special receptor cells that are activated by lactic acid emitted by the skin of warm-blooded animals. With the chemical receptor cells blocked, the homing system of mosquito fails to detect humans or prey around. Your Outdoor Wedding! How to Keep Mosquitoes Away?